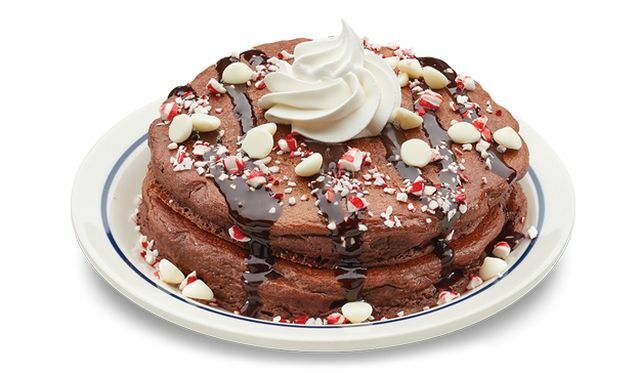 The NEW holiday celebrations menu has arrived at IHOP and we were so excited to have the opportunity to try out some of the holiday pancakes!! IHOP is without a doubt our favorite breakfast spot – it’s the only one in Calgary and right down the street from where we live. · NEW! Dark Chocolate Peppermint Pancakes – Rich chocolate pancakes, topped with crushed peppermint, white chocolate chips and a drizzle of dark chocolate, and crowned with creamy whipped topping. · Eggnog Pancakes – Eggnog Pancakes feature eggnog cream swirled with cinnamon and nutmeg, layered between warm buttermilk pancakes. Finished with a sprinkle of cinnamon sugar, butter rum sauce and whipped topping. · Pumpkin Spice Pancakes – A perennial IHOP fan favorite, Pumpkin Spice Pancakes bring back memories of hot pumpkin pie baking in the oven. Enjoy three fluffy pancakes made with real pumpkin, cinnamon, ginger and nutmeg, and crowned with creamy whipped topping. · Roasted Turkey and Fixings with New! Bacon Mashed Potatoes – Carved roasted turkey breast topped with warm gravy and served with cornbread stuffing, bacon mashed potatoes, steamed fresh broccoli and a side of lingonberries. · New! Frosted Mint Hot Chocolate – Rich hot chocolate flavored with Frosted Mint syrup, finished with whipped topping. · Toasted Marshmallow Hot Chocolate – Hot chocolate flavored with Toasted Marshmallow syrup and whipped topping, finished with cocoa powder. Jon ordered the ultimate bacon and sausage combo with the eggnog pancakes and I ordered a two stack of the pumpkin spice pancakes AND the dark chocolate peppermint pancakes with a side of hash browns. Overall, we really enjoyed all three of IHOP’s holiday pancakes!! I liked the dark chocolate peppermint pancakes the best – I'm a sucker for anything chocolate and they reminded me of those mint peppermint patties. On the other hand, Jon liked the pumpkin spice pancakes the best – he thought they tasted a lot like pumpkin pie. So what are you waiting for? Head to IHOP and check out the holiday celebrations menu before it's gone!! While you're there, pick up a $25 gift card and receive a $5 coupon for your next visit! !